Annie Leibovitz: A Photographer’s Life, 1990–2005, an exhibition of more than 200 photographs, debuts at the Brooklyn Museum, where it will be on view from October 20, 2006, through January 21, 2007, prior to an international tour. The exhibition, sponsored by American Express, is being organized by the Brooklyn Museum. Among the other venues it travels to are the San Diego Museum of Art, the High Museum of Art, the Corcoran Gallery, the de Young Museum, Maison Européenne de la Photographie in Paris, and London’s National Portrait Gallery. The material in the exhibition, and in the accompanying book of the same title, published by Random House, encompasses work Leibovitz made on assignment as a professional photographer as well as personal photographs of her family and close friends. “I don’t have two lives,” Leibovitz says. “This is one life, and the personal pictures and the assignment work are all part of it.” The material documents the birth of her three daughters and many events involving her large and robust family, including the death of her father. Portraits of public figures include the pregnant Demi Moore, Nelson Mandela in Soweto, George W. Bush with members of his Cabinet at the White House, William S. Burroughs in Kansas, and Agnes Martin in Taos. 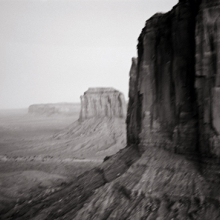 The assignment work also includes searing reportage from the siege of Sarajevo in the early 1990s and a series of landscapes taken in the American West and in the Jordanian desert. One of the most celebrated photographers of our time, Annie Leibovitz has been making witty, powerful images documenting American popular culture since the early 1970s, when her work began appearing in Rolling Stone. She became the magazine’s chief photographer in 1973, and ten years later began working for Vanity Fair, and then Vogue, creating a legendary body of work. In addition to her magazine work, Leibovitz has created influential advertising campaigns for American Express, Gap, Givenchy, The Sopranos, and the Milk Board. A retrospective of her work from the years 1970 to 1990 was presented at the National Portrait Gallery in Washington, D.C. and at the International Center of Photography in New York. Leibovitz is the recipient of many honors, including the rank of Commandeur in the French government’s Ordre des Arts et des Lettres and the Barnard College Medal of Distinction. She was named a Living Legend by the Library of Congress in 2000 and one of the thirty-five Innovators of Our Time by Smithsonian magazine in 2005. Charlotta Kotik, John and Barbara Vogelstein Curator of Contemporary Art, is the curator of the exhibition. As part of the Annie Leibovitz Talk Series, Jane Sarkin O’Connor, Features Editor of Vanity Fair magazine, shares her insight into her personal relationship with Annie Leibovitz and her own extensive experience with commercial photography. The following recording of photographer Annie Leibovitz is from an interview that took place at the artist’s studio on September 28, 2006, related to the exhibition Annie Leibovitz: A Photographer’s Life, 1990–2005.